The seller of today’s Nice Price or Crack Pipe T4 Doka says it’s literally sitting at the dock with two of its smaller “Sinka” brothers. Let’s find out if its price might make it a worthy port ‘o call. There’s this old Doris Day movie entitled With Six You Get Eggroll. Although I’ve never actually seen the 1968 flick, I do love that title, and I did discover that it’s notable for being the screen debut of one of my all-time favorite comedians, George Carlin. I bring this up because yesterday’s custom 1982 Jeep Cherokee came with six wheels, and while it may have appeared to have been something out of a screwball comedy, with those six, you don’t get bankroll. No, that odd bodkin Jeep’s $18,000 price tag engendered not just some vitriol in the comments, but also a 58.60-percent Crack Pipe loss. 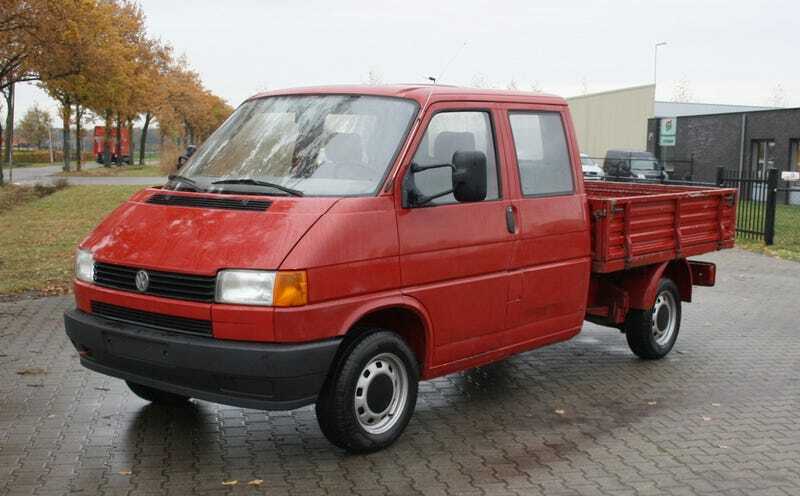 Okay, let’s now get back to a more typical tire count, and have a look at this 1991 Volkswagen T4 Doppelkabine. Now, you may be very well versed in the earlier versions of the Doka, and are likely also up to speed on the incredible prices asked for them here in the States. That of course, is owed to two factors: the Doka’s inherent utilitarian funkiness, and the fact that the precedent T3 edition was never officially sold here in the U.S.. These weren’t either, although back in the ‘90s for a short time you could get one in Canada. This one is said to come here through some sort of agreement with the Netherlands-based importer/exporter Dutch Auto Parts. That company does parts sourcing as well as whole-car shipping, although usually the latter is done through (again) Canada since everybody up there is a lot cooler than down here. The seller says that he’ll take care of the import and titling issues here in the States, you just need to pony up the cash first. But, would you want to? The T4 Doka is very much like its rear-engined predecessor. This edition has three doors in its crew cab—one off-side and two curb adjacent. It rides on the long —3,320 mm—wheelbase, and carries a pickup bed with a flat floor and three sides that fold down in back. The T4 of course has a longer nose than the T3. That’s to accommodate the FWD engine layout and to give your patellas something other to do than act as crush space in an accident. In that nose resides a 1.9-litre naturally aspirated diesel four. That’s good for a mere 60-horsepower and 94 lb-ft of torque so don’t expect this Doka to drag race anything other than snails and that hilarious sloth from Zootopia. A five-speed stick helps this Doka’s diesel be all that it can be. The bodywork is a bit dinged up, but still totally serviceable. The ad notes that this was a work truck, and the pictures prove that out. There’s extensive scraping on the inside of the rear door, and on the dash, but it’s all aesthetics and shouldn’t affect operations. Nicely, all the upholstery seems to have held up well. If you’re seeking creature comforts, this ain’t your van. There’s manual windows and no radio so cruise night would have to be a lot more basic in this. The rubber floor covering should make cleaning out even debauched bachelorette party level vomit extremely easy. On the bright side, the truck is said to come with new brake hoses, sandblasted and painted steelies, and new lights in the back. The ad also mentions a major mechanical service including the timing belt and all the might-as-wells underneath that, as well as a new long-side axle. There’s 225,000 KM on the clock—about 140,00 miles—and the ad says everything works as it should. The question we need to ask is whether someone should spend the $9,750 the seller is asking to bring this Doka off the dock. What do you think, is this funky truck worth that kind of cash here? Or, for that much should this T4 take a hike? The Samba out of Washington State, or go here if the ad disappears.